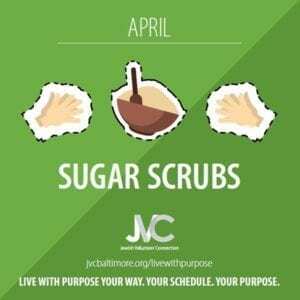 In preparation for Mother’s Day, join JVC to Live With Purpose by making sugar scrubs to treat and support women in our community. Sugar scrubs are used as a bath/shower item that helps nourishes the skin and help women in crisis care for themselves. Who are we helping? Sugar scrubs are donated to local women’s organizations like CHANA and DRU/Mondawmin Healthy Families. Mix white sugar, raw cane sugar, oil, and vanilla in a large bowl. Add a few drops of an essential oil of your choice and mix. Put the scrub into the small container. Add a sticker to the top of the container. Write a kind note (“Enjoy!”) on a tag and attach it to the container. Learn more about the importance of self-care during traumatic experiences and use discussion questions with your family/group! Click here! To make this project even easier, JVC is selling most of the supplies you need, including jars, sugars, and essential oils in sets with 10 jars and 1 bottle of oil. Please not that during Passover, supply bags will not include the sugars. Supplies can be picked up at the Park Heights JCC, after coordination with staff. Once the project is done, you will also drop off at the Park Heights JCC. Alternate arrangements can be made as needed. Please give JVC staff up to 4 business days to complete your order. $18 for supplies for 10 Sugar Scrubs and 1 Essential Oil.